Looking down on my right knee, a small wound is sending the signal of slight pain to my brain. It’s irritating yet delightful as the wound reminded me of having a wonderful weekend with my friends at Muskoka. My taste buds were pampered by tasty foods and a bottle of premium sake in the resort. Some of my friends are golf enthusiasts, and therefore we spent last weekend at Rocky Crest Golf Resort. However, golf is not my sport. My interests are water sports and hiking. Since Rocky Crest is a lakefront resort located on the shores of Lake Joseph, facilities for water sports are available there. I jumped on the water paddle boat with a friend immediately after lunch, and we comfortably cruised on Lake Joseph. Afterwards, we went for a walk in the woods. The resort has built a number of trails in the property, and we chose the route which could take us to Armishaw Lake and the beaver pond. In the summer months, mosquitoes are always hikers’ enemies. We were chased by hundreds of mosquitoes in the woods that we had to finish hiking at our fastest pace. Soon after we exited the woods, I started to check how many mosquito bites I got. I touched my head, my arms, then my legs. All of a sudden, I saw blood on my right hand! It’s blood!!! My friend and I were shocked and I instantly looked down on my legs. There was blood streaming out of the wound on my right knee! Then I recalled that my knee was punched by a fallen tree branch when I was walking in woods. Since I did not feel much pain from the wound, and more importantly, I was very much annoyed by the mosquitoes, what I had in mind at that time was getting out of the woods as soon as possible; therefore, I had a glance on my knee and then resumed walking until I went out of the woods. It took us 20 minutes to walk back to the suite we stayed at. When I stepped through the main door , friends in the suite were all shocked to see my bleeding knee. Since I had lost blood from the injury, I decided to boost my iron intake from foods. That’s why I chose to have steak for dinner. After having a nice dinner at the restaurant with a gorgeous view overlooking the golf course, it’s my sake tasting time. 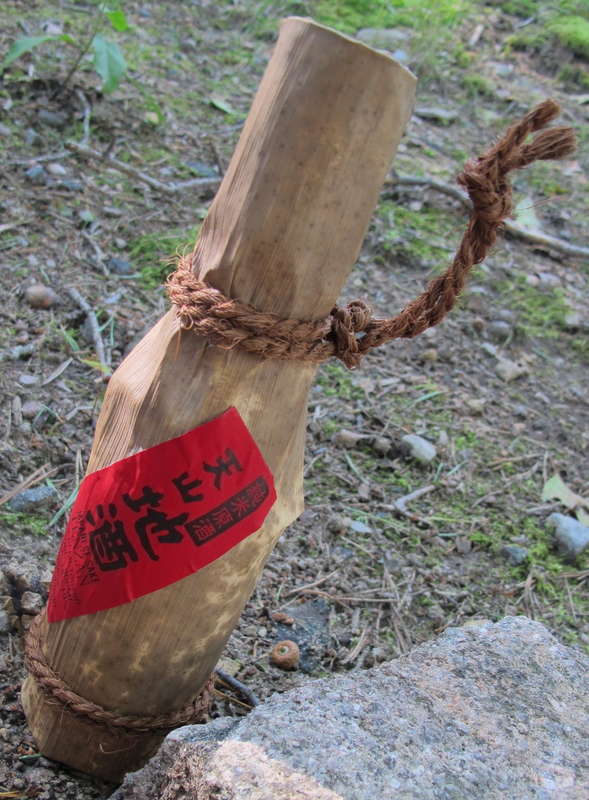 I opened the Jizake Tenzan (category: Tokuetsu Junmai Genshu) that I took to the resort. It was clear and colorless in appearance, with mellow aroma. Since it’s undiluted in the brewing process, the Tokuetsu Junmai Genshu had stronger alcohol content than average sake, which made me feel that the sake was powerful and flavourful when I ran it through my palate. Although this sake was brewed in Saga Prefecture, where is renowned of brewing sweet sake, the alcohol I drank was anything but dry. The rich and full-bodied Jizake Tenzan had a settled fruity taste and a rice-forward flavour, with a smooth finish. One of my friends said, “this is an outstanding sake as it has the taste characteristics of rice wine.” Another friend, who is a fan of brandy, cognac and whiskey, also highly praised Jizake Tenzan. I believe it was because this sake tasted more like a liquor than a wine. Jizake Tenzan is best enjoyed chilled. I recommend to pair it with food having intense flavours such as steak, salted salmon, fried chicken, sukiyaki, and tempura tendon.